Chapters are comprised of all the deanery clergy. In Tower Hamlets they are drawn together by the Area Dean working with the sub deans. Together the whole chapter work to support the pastoral and missional life of the Church of England across the borough. The term chapter comes from the monastic tradition when all the brothers or sisters of a religious community would gather daily to read a chapter of their rule, by doing so they built up their common life and deepened their common commitment to following Jesus. T8-9 Oct Chapter Retreat - Bishop Woodford House Ely 11am Tues - 2pm Wed.
July - St Chads Haggerston - Mission from Different Angles - Three Way Chapter with the Millers. 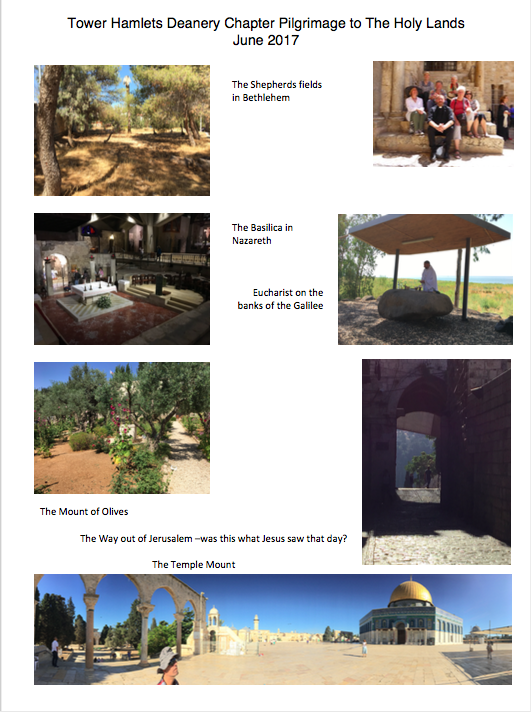 June - Deanery Trip to the Holy Lands See some pictures. December - A great Clergy and partner Christmas Party at the Area Deans. January 2013 - 'Church schools now and in the future' NOTES Jan's PPT slides can be viewed here. December Chapter Christmas party - no notes!! Rev Ken Leech Vicar of St Matthew Bethnal Green from 1974-1979 believed this too. He was a founder member of the jubilee Group, and began what is today called Centrepoint, one of London leading homelessness charities. He also wrote extensively on christianity, social action and spirituality books such as 'Soul Friend' and 'Doing theology in Altab Ali park' still inspire today.